Well, I have officially been in Thailand for 90 days and in order to stay longer I have to leave the country to reactivate my double entry Thailand tourist visa. Currently, I have been residing in Chiang Mai, Thailand. 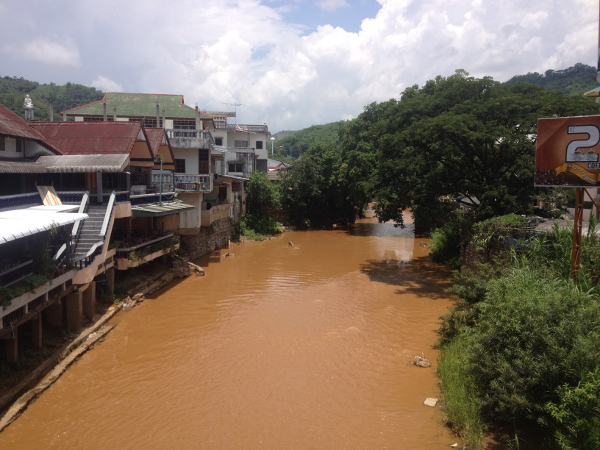 The closest destination to leave the country and cross the border is Mae Sai, Thailand. Mae Sai borders with the country of Myanmar also known as Burma and is a 4-5 hour bus ride, one-way north of Chiang Mai. Making border runs for tourists is a business in itself, in Thailand. There are many companies that offer bus services to go to the border and do what is known as a “border run.” Simply crossing the border to enable you to stay longer within the country depending on the rules or lack of rules within said country. The day prior to departing, I wanted to secure my bus ticket for Mae Sai. I had a friend tell me of a mini bus company that operated across the street from the Chiang Mai bus station. I went to their office and inquired about any bus services to Mae Sai. Currently, they are not going to the border because Thailand has become more strict on renewing Thai tourist stamps within the last few weeks. Technically, you are allowed 30 days within the country as a tourist when you arrive. This “stamp” is not a visa. It is critical that you understand the difference. Prior to arriving to Thailand, I applied for a double entry Thailand tourist visa at the Los Angeles Thai embassy in the United States. Since I was issued that visa while in the US I have been able to stay for an extended period of time comparatively if I had arrived and been issued a tourist stamp. After I visited the mini bus company, I went to another part of the old city to inquire with a different border run bus company. The result was the same, “we are not offering visa run services at this time.” Both companies suggested that I go the local bus station. With little time remaining in the day, I decided that I was running out of options and I needed to get to the border. 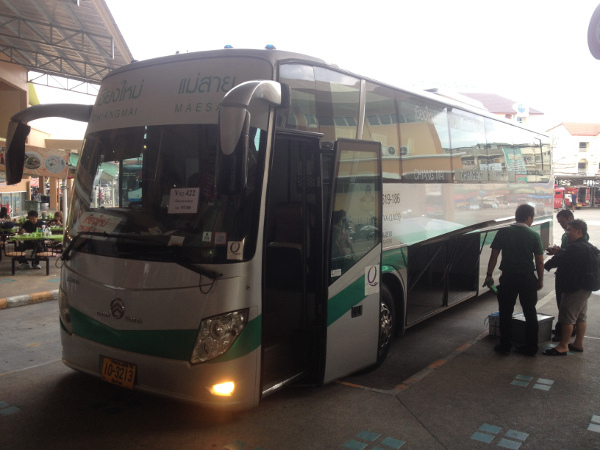 I went to the local bus station and was able to get a bus departing at 7am for Mae Sai with the Green Bus company. The process was painless and easy. I purchased a round-trip ticket with no problems. The cost was a little over 700BHT or 24USD for a round-trip ticket. The following morning I got up at 6am, took a shower, and had breakfast. 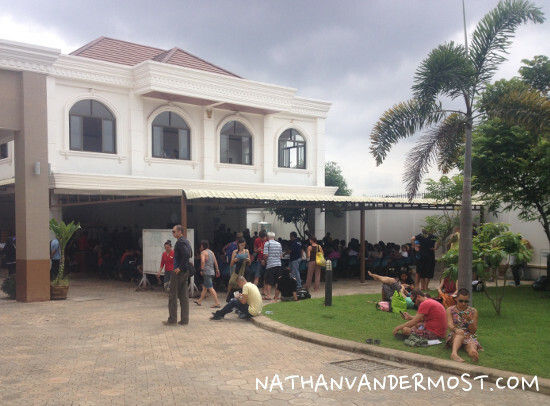 Fortunately the bus station is a short motorbike ride away from where I am staying. When I arrive, I go to a motorbike storage facility across the street from the bus station. You hand them the bike and you get a bike slip to retrieve the bike when you return. I cross the street to the bus station and the bus that I am taking to Mae Sai arrives at the same time, at 6:45am. My ticket has a time of 7am, which is the time that the bus departed. Not 7:05am or later but 7am sharp! The bus is a large bus that you would find in the US. The seats are big and comfortable. The bus is also air-conditioned. It is sooo cold that I put on a fleece sweater during the ride. I had been pre-warned from a friend that the buses can use excessive air-condition and this ride confirmed that fact. Although, the ride was relatively long (4-5 hours), it was comfortable and I was able to get some sleep. The bus makes several stops along the way at other bus stations. This is an opportunity to use the bathroom (have change on you as it costs money), stretch, purchase coffee and/or food, etc. 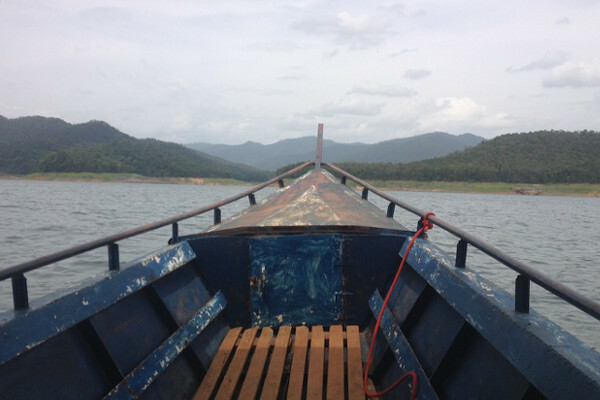 Once we arrived at the bus station in Mae Sai, I needed to get to the border. 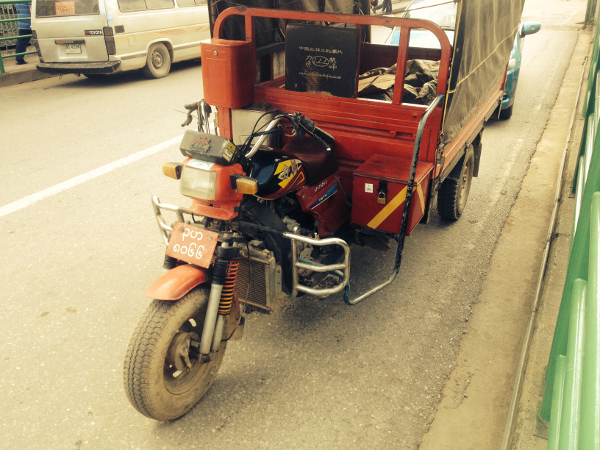 I exited the bus, walked literally 3 steps and hoped into the truck bed of a Songtao (taxi). “Wow,” I thought to myself. That was too easy. Ten minutes later, I find myself looking at the Myanmar border. Everyone departed the songtao and paid 15 BHT or .50 USD. I look around and try to gauge my surroundings. “Where do I go?” I start walking to a large gate that covers the road. It is clear that I am headed in the right direction as there are lines of traffic and foot traffic. There are lines of people and signs that are all written in Thai script. Huh? It turns out to be super simple. No sweat. You do not need any special forms except for your departure card which is given to you when you enter Thailand, initially. Not sure what you can do if you do not have it… Fortunately, I did not have to find out. Beware, there was another traveler that had a tourist stamp, not a visa. She waited 7 days after the date in which she should have departed the country which is indicated within your passport, therefore incurring a penalty of 500 BHT or $17 USD per day! Her total was 3500 BHT or $116 USD. Now, you have two options. You can continue walking across a bridge into Myanmar or you can cross the street and go back into Thailand. My bus did not depart until 2:30pm back in Mae Sai. Therefore, I had 2 hours before I had to be back at the bus station. I opted to enter my 16th country, Myanmar! Although, I was only in the country for 1.5 hours it still counts because it is not at an airport. Just saying. You do not need a visa to enter the country but you do need to pay 500 BHT or $16 USD. After crossing the border it was very clear that I was no longer in Thailand. I stand out like a single cloud in the sky. I am approached aggressively by people selling cigarettes and every narcotic under the sun including opium. Um… no thanks… I was hoping for a enriching cultural experience. So far I think, I would have been better off to stay in Thailand. After clearly indicating that I was NOT interested in anything that they had to offer I walked down some stairs to a local market. The market was very similar to markets that you would find in Thailand but had some items that you would not find too. There were several stalls that had 100’s maybe even 1000’s of copyrighted dvd’s for 30 BHT or $1 USD. I was not interested in buying any movies but there are a few people that crossed the border for this purpose. One stall that did catch my eye had a surprising selection of outdoor clothing brands such as Patagonia, Arcteryx, The North Face, and more. Although some of the apparel was not authentic, I believe that some of it was. I was able to purchase a synthetic shirt and synthetic pants for a descent price comparatively to what they would have cost in the states. After walking around and looking at different stalls I left shortly thereafter. In conclusion, the selection was descent but nothing that I was in the market for. Although my experience in Myanmar was interesting and a little uncomfortable I was glad that I made the short trek and would like to return. I have heard from other travelers that the country is an amazing place to visit especially because it has been open to tourism within the last year or two. Ok! Back to information about crossing the border. I walked back through Myanmar immigration which was painless and did not result in any harassment or questions. I walked across a bridge that divided the entrance of the Thailand and Myanmar border. One funny occurrence that I saw was that traffic that was crossing from one country into the other had to change the side of the road that they drive on. The reason for this is because Myanmar drives on the right side of the road whereas Thailand drives on the left side of the road. Good thing that I am not driving! Before talking to a Thai immigration officer and re-entering Thailand, I had to fill out a new arrival card. There was no line and I was able to complete the arrival card and talk to an immigration officer within a few minutes. The officer looked at my passport, saw my Tourist Visa, stamped my passport, initialed, and BAM! I am back into Thailand. No questions and no problems. If only all border crossing were this easy. There are several officers that search your bag, which is painless and then I walked onto Thailand turf just as easy as I had walked off of it. I am confused because he is speaking english. “Um… yeah. Of course.” We engage in basic conversation and it turns out that he has a very interesting background. He is originally from Bhutan and moved to France when he was 4.He is currently studying massage in Chiang Mai. Wow! You do not meet people like this very often. The bus arrives and we board. The bus is the same model as the bus that I had taken this morning. Ok! Only 5.5 hours to go and I will be back home! One minor detail to mention regarding the bus ride is that there are 2-3 military checkpoints. The bus pulls off to the side of the road and one or two military personnel board the bus. They ask everyone for identification and they look at it briefly and then depart the bus. The whole process takes 5-10 minutes. Following, I was able to get some sleep, dozing off and on for the rest of the ride back to Chiang Mai. At last, we arrive to the train station at 7:30pm. Whoa! What a day! It is raining really hard. I cross the street to retrieve my motorbike and get back to my place, safely. Whew.